Dating to the 1920's, and is of high quality glass and workmanship and is a Wilkinson. 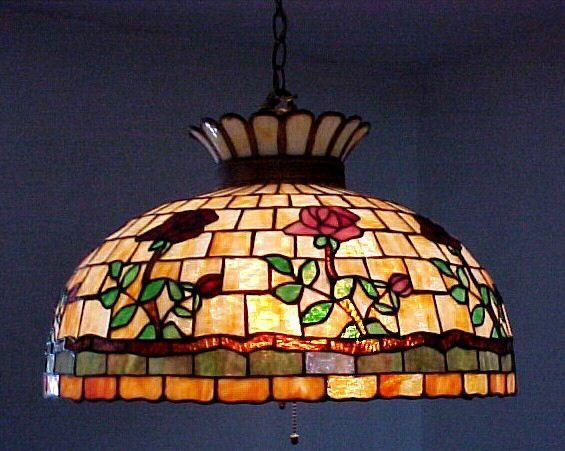 It has a rose motif with eight leaded roses around the lamp as seen in the photos. These are in alternating red and pink colors with green leaves and stems. The lamp measures 21 1/2" in diameter and 11 1/2" in height. It has a two light socket and has been rewired. There are four tight heat lines but they do not distract from the lamp and are not visible unless you take a very hard look to find them. Priced to sell.